Data from Malek Ž and Verburg PH (2017). Mediterranean land systems: Representing diversity and intensity of complex land systems in a dynamic region. Landscape and Urban Planning, 165: 102-116. In the Mediterranean region, land systems have been shaped gradually through centuries. They provide services to a large and growing population in a region that is among the most vulnerable to future global change. The spatial extent and distribution of Mediterranean land systems was, until now, unknown. We present a new, expert-based classification of Mediterranean land systems, representing landscapes as integrated social-ecological systems. We combined data on land cover, management intensity and livestock available on the European and global scale in a geographic information system based approach. 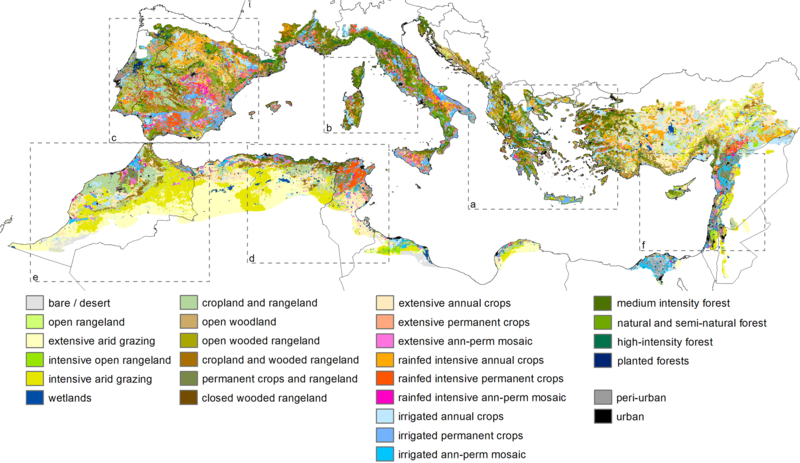 We put special emphasis on agro-silvo-pastoral mosaic systems: multifunctional Mediterranean landscapes hosting different human activities that are not represented in common land cover maps. By analyzing location conditions of the identified land systems, we demonstrated the significance of both bio-physical (precipitation, soil) and socio-economic (population density, market influence) factors driving the occurrence of these systems. 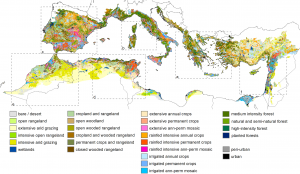 Agro-silvo-pastoral mosaic systems were estimated to cover 23.3% of the Mediterranean ecoregion and exhibited to a certain extent similar characteristics as forest and cropland systems. A reanalysis using data that are available with global coverage indicated that the choice of datasets leads to significant uncertainties in the extent and spatial pattern of these systems. The resulting land systems typology can be used to prioritize and protect landscapes of high cultural and environmental significance.